Cherish is made of vinyl by the artist Fayzah Spanos who has won many honours for dolls since she founded Precious Heirloom Dolls in 1986. She lives and manufactures fine quality vinyl dolls from her studio and manufacturing plant in Tarpon Springs Florida in USA. Fayzah's creations capture the remarkable expressions of her true to life sculptures which are inspired by babies and children she knows. Her vinyl works of art are handcrafted in United States. Limited editions are numbered and signed as they are produced. Faysah's signature is your evidence of ownership of her work of art and craftsmanship. "Cherish" is one large beautiful doll who looks just like a chubby toddler baby. and is part of the Cherub Collection.
. Her head cannot be moved in different directions, but her legs and arms are able to be moved.
. a long wispy curly black glued on wig which can be brushed. .eyes are fringed with black eyelashes both upper and lower lashes.
. a cute little pert nose, an open full mouth showing top white teeth.
. a dimple in her chin and little chubby cheeks.
. cheeks have a nice of amount of blush on them as well as the back of her hands, knees and feet.
. the appearance of a real child with all the creases and dimples on her vinyl body. Her outfit is original to her and is made of white satin with a pink net overlay and a net bow at the back. She is wearing a spray of golden grapes on the bodice of her dress. She also is wearing a garland of the same grapes on her head. Her cloth body has her original tag attached to her. Dated 1996 and signed by Fayzah Spanos. She is also signed behind one ear with Fayzah's signature and confirming the limited edition numbers on the Certificate. White cloth body is showing some aged spots and cannot be seen under her clothes. Her eyes are an unusual colour, and not sure if they have changed over the period of time. We always try to bring you unusual and rare items. 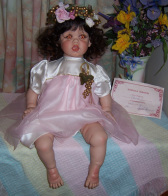 This doll is no exception and is a collectors doll.